I’m not sure when the phrase, “Go to your room,” was first used by a frustrated parent, but I would guess it was probably about 15 minutes after the first kids’ bedroom was built. 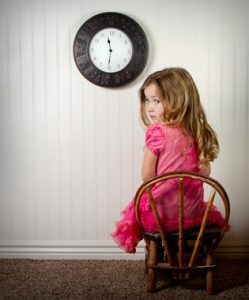 The suggestions we hear on raising our kids these days seems to change about as often as the weather, but the good old-fashioned “time-out” is one disciplinary tool that never seems to go out of style. There’s a reason for that. Time-outs can be very effective. They give both parent and child a little breather, which helps avoid unpleasant outbursts on both sides. But it’s important to know how to use them effectively. Otherwise, you may be reinforcing the very behavior you’re looking to keep in check. 1. NOT USING A TIMER. Once you’ve sent your child into time-out, they’ll typically try to negotiate with you for shorter times, bathroom breaks, a glass of water, their blanket, and anything else they can possibly come up with. This is usually an attempt at a power struggle, rather than a genuine request. In their minds, if you’re still talking to them while they’re in time-out, they feel like they’ve got control over the situation. The most common of these tactics is asking how much time they have left in their “sentence,” and once they get a response, they’ll ask it over and over again. They probably have no real interest in how long they have left, of course; they’re just trying to engage you. So they test the water. They check to see how many warnings they can get before they’re actually punished. This is another situation where consistency is absolutely vital. When you issue the warning and the behavior continues, be sure to follow up quickly and decisively. Once your child realizes there are no second warnings, they’ll quickly start to adjust their behavior after you give the first one. I had a friend a number of years ago whose idea of a time-out was to force her child to sit on her lap for five minutes. Some deterrent! Needless to say, her son was frequently misbehaving and got plenty of time-outs. I understand the motivation behind giving time-outs in comfortable places. It helps keep the peace, but it completely defeats the purpose. After a confrontation, kids will often want to go to their rooms. It’s their fortress and they feel safe and comfortable there. A neutral area will help to keep them focused on the behavior that caused the time-out in the first place. My husband and I typically use the laundry room for time-outs. The window doesn’t look out onto anything interesting, there are no toys or games to remove, and the shelves are high enough to place the timer out of reach. Disciplining your children is never enjoyable, but it’s necessary, and when it’s done effectively, it reinforces good behavior and reduces frustration for both you and your child. Consider it an investment. If you do it impartially and consistently early on, it will mean less fights and better behavior down the road. 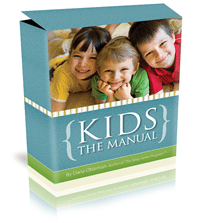 If you haven’t yet, you may want to check out Kids: The Manual. It’s a discipline system that is designed to deal with some of the most common behavioral challenges in children ages 2-12. PreviousPrevious post:Why Do MY Kids Always Seem To…NextNext post:Would You Change THIS About Your Child?